You may already have a water filter in your kitchen to filter your drinking water – but what about your shower? Chlorine and other chemicals can easily dry out hair and skin, and leave unpleasant smells to deal with. A filter can help – today, we’ll help you find the best shower water filter of 2019! There are basically two types of these filters: versatile filters that work with your existing shower head, and filtered shower heads which replace your existing setup. Both have some pros and cons, so we’ve listed both in this guide to help you choose. The AquaBliss High Output Universal Shower Filter might just be the best shower water filter on the market today! It installs easily onto your existing shower setup, and it’s versatile enough to work with practically any shower head. This type of setup is ideal if you already like your existing showerhead and just want to add a filter to it. Otherwise, you’re better off getting a good filtered shower head. 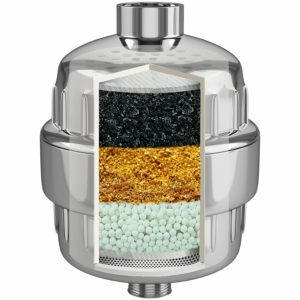 The multi-stage filter uses a combination of activated carbon, KDF 55 and calcium sulfate to filter out chlorine, heavy metals, bacteria, pesticides and more! The AquaBliss is a best-seller on Amazon, and it’s easy to see why. It’s consistently earned great reviews from customers due to its ease of use, effectiveness and relatively low cost. The filter is designed to last for 10,000+ gallons of water, which should be 6-8 months with normal use – and replacement filters are very affordable. We rated this as the best shower water filter 2019 because it’s affordable, well rated, and it works great. The versatility is another huge plus, as the AquaBliss will work with any existing shower setup, whether you have a fixed head, rain-style head, or even a handheld setup. Click here to learn more. 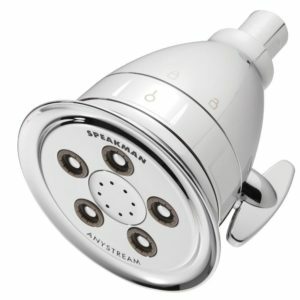 The Speakman Hotel Pure is perhaps the best filtered shower head on the market. It’s made by one of the most-established names in the game: Speakman, which has been in business since 1869. 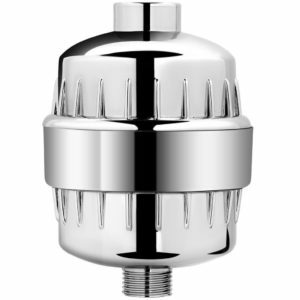 They are known for their sleek, highly functional, high-flow shower heads. This product fits the same style that Speakman is known for, with the addition of a built-in filter. If you’re looking for a low-flow model to save water, Speakman also has this same shower head in 1.75gpm and 2.0gpm flow rates. We tested the 2.0gpm unit and found that it felt like it had just as much pressure as a standard 2.5gpm head, while using 20% less water! The Speakman is also highly customizable, with a whopping 50+ different spray patterns to choose from! This model is used in tons of hotels because it’s a versatile favorite among visitors and hotel guests. It’s also easy to install and use, and the filter is designed to last 6 months. If you want an all-in-one unit and don’t want to deal with a separate filter and shower head, this is a great choice. Click here to learn more. The Brom4ord Shower Filter is a budget-friendly pick, but an excellent product overall. It features a 3-stage filter with calcium sulfate, KDF-55 and activated carbon. These three filters work together to reduce chlorine, heavy metals, minerals and more. This unit is just a filter, which will require a separate shower head. It is easy to install, and can simply be added above your existing shower head. It should work with almost any setup, so long as your shower uses standard size piping. Despite the low price, this is a well-made, dependable product with a great reputation in shower water filter reviews. It’s also backed by a 100% satisfaction guarantee from the manufacturer! It’s the best shower filter for those on a budget. Click here to learn more. Less Chlorine – Chlorine is present in most municipal water supplies, as it’s used to kill harmful bacteria. Unfortunately, it can also kill good bacteria, and it can also cause skin irritation. Plus, the hot temperature of a shower can cause the chlorine and other chemicals to vaporize, which can lead to us breathing in Chloroform and other potentially harsh chemicals. One clinical trial actually found that showering in chlorinated water was more harmful than drinking it, and could potentially lead to cancer and other serious health concerns. Healthier Skin & Hair – Chlorine can destroy proteins in and on the body, leading to dry, itchy skin, and dry, brittle hair – among other problems. Chlorine also strips the skin of natural oils that help to hold moisture in, which only worsens the problem. Lower Risk of Health Concerns – Some of the chemicals routinely found in shower water can cause some serious harm over time. Chloroform, a byproduct of chlorine, can cause bladder cancer and may even increase the risk of birth defects and other adverse reproductive outcomes. Although it seems counter-intuitive, your daily shower could actually be making you sick and increasing your risk of various diseases. Cleaner, Better Smelling Water – Depending on the quality of your local water supply, adding a shower head filter might have an immediately noticeable effect on the appearance and odor of your shower water. In addition to chlorine, the best shower filters also help remove sediment, heavy metals and other gunk that you don’t want to be bathing in every day. Filtration Type – Different types of filters work better for different contaminants. We tried to pick filters that used a combination of different filtration methods, for best results. Durability – We looked at the composition and design of each product to gauge how long it would last. If there was a warranty offered, that was also factored in to our decision making process. Value – Price played an important factor in our rankings. We didn’t necessarily choose the cheapest option, but we wanted to offer good value to our readers and help them save some money. We also accounted for the long-term costs (i.e. replacement filters) in our calculations. Reviews – We looked at third-party shower filter reviews to get a better sense for how long these devices were lasting, and what the average consumer experienced with the product. This also helped us get a better idea for how each filter worked in various areas that had different water quality to begin with.